The White Rim Trail, located in the Island in the Sky district of Canyonlands National Park, in Utah is a 100 mile long bumpy dirt road. Erik Weihenmayer rode it on a tandem with his captain Charley Mace. 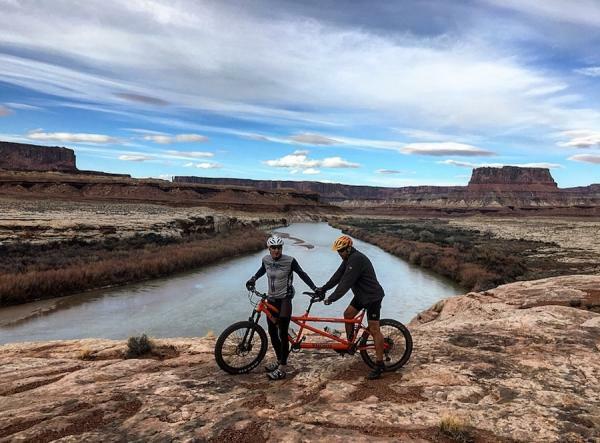 The trail takes cyclists along the “White Rim” layer of sandstone, with dramatic canyons below and majestic red rock cliffs above. The trail leads to arches, towers and other fantastic rock formations. Way to go, Erik! Read Erik’s blog of his journey by clicking here.